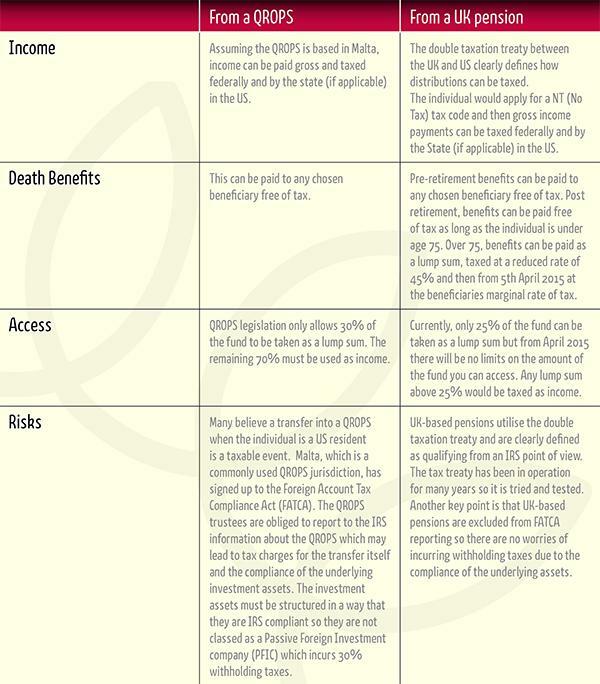 Pension planning for Brits in the US – QROPS vs UK pensions. For a long time now, the appropriate use of QROPS for British expats who are resident in the US, has been in debate. Some see it as a credible solution whilst others say that the risks far outweigh the benefits. QROPS are a legitimate pension solution to a great many British expats but a good quality financial adviser should always consider the impact of the clients’ residency and how the local tax laws will affect the benefits of a QROPS. What may work very well for an expat in Portugal may be completely different to one in the US. The April budget and Mr Osborne’s recent announcement around the taxing of death benefits from a UK pension, however, certainly improve the argument to use a UK based solution. Let’s look at the two in more detail. Generally QROPS can be a good solution for British expats but for those in the US, a thorough assessment needs to take place as to whether the risks are just too much to outweigh the benefits. The recent changes to UK pension legislation have greatly improved the death benefits and access to retirement funds. There are UK pensions which are designed for Brits in the US and we expect the market for these products to increase rapidly now that this type of option is relevant and very attractive. The answer to which pension is more suitable will, as ever, depend upon your individual circumstances but with so many changes to pensions, their taxation and how benefits are taken, it is imperative for people to take Financial Conduct Authority regulated, independent financial advice to help them make the right choice.